This recipe follows the tradition of Comida Criolla, a fusion of native products and immigrant cooking styles in Peru. When Spanish cooks stuffed the local rocoto peppers with introduced products: beef, onions, cheese and raisins, they developed one of criolla’s classic recipes, Rocoto Relleno. 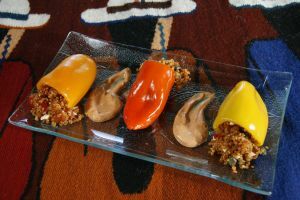 Our version of stuffed peppers uses most of the traditional ingredients but substitutes quinoa, one of the native grains of Peru, for the ground beef. Rocoto peppers of Peru are small, red and have a good dose of heat to them. I have not found them here. So I stuff small multicolored peppers from Mexico and add chili powder in the filling for added heat. In a medium sauce pan cook the onion in the oil until soft. Add the garlic, carrot and bell pepper and cook until soft, about 5 minutes. Stir in the raisins, chili powder, quinoa, water and salt to taste. Cover and let cook over medium-low heat for 15 minutes. Without lifting the lid, turn the heat off and let quinoa steam for 15 minutes. Meanwhile, bring a medium sized pot of salted water to a boil. Slice just the top off of each pepper and remove the seeds, leaving the pepper intact. Cook the peppers in the water until just soft, about 3 minutes. Drain on paper towels. Blend the capers and cheese into the quinoa and stuff the peppers. Place the peppers on an ovenproof plate and heat through in the oven or microwave to heat through and melt the cheese. Remove to a serving plate and serve warm with garlic sour cream sauce.